I have implemented my own closeable JTabbedPane (essentially following advice from here - by extending JTabbedPane and overriding some methods and calling setTabComponentAt(...)). It works perfectly except one thing - when there are too many tabs to fit on one row (when there are 2 or more rows of tabs), the cross button/icon is not aligned to the right of the tab but it remains next to the tab title, which looks ugly. I've tried the demo from Java tutorials and it suffers from the same problem. What I want is that the cross button/icon is always aligned to the very right, but the text is always aligned to the center. Can this be achieved by some layouting tricks? 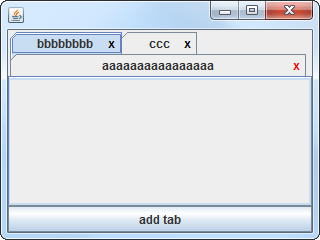 Note: I do not want to implement a custom TabbedPaneUI as this leads to other problems. The complete code is below, just run it and add 5 or more tabs. * CloseableTabbedPane is a tabbed pane with a close icon on the right side of all tabs making it possible to close a tab. * You can pass an instance of TabClosingListener to one of the constructors to react to tab closing. * Sets the file name of the closing icon along with the optional variant of the icon when the mouse is over the icon. //note: setToolTipTextAt(int) must NOT be overridden ! The close button is painted by this itself so if can be placed anywhere. How can I use tabInsets when using getSystemLookAndFeelClassName()?